Although the origins of electric model cars can be traced back to the turn of the 20th century, it is generally accepted that slot car racing is a direct descendent of rail racing, which was popular from the mid to late 1950s. D.J. Laidlaw-Dickson, editor of Model Maker magazine, credits Geoffrey Deason as the founder of rail-racing, which led directly to slot racing as we know it today. Deason wrote an article for Model Maker in 1948, suggesting that battery-driven cars could be raced on small indoor tracks guided by wooden rails. The idea appears to have been an adaptation of the king-size outdoor tracks long used in England and the USA (where they originated) for racing diesel and gasoline engine cars. These big cars, built to a scale of 1/18th to 1/16th, ran largely uncontrolled on sprawling tracks, held on a rail by a pair of spool-shaped devices known as 'zonkers'. 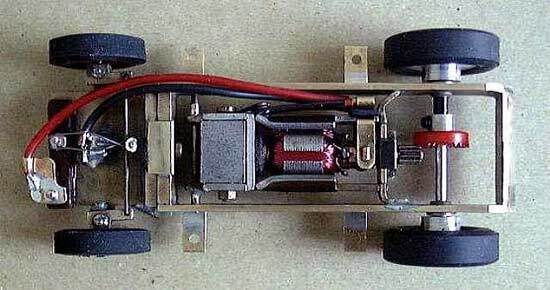 Late in 1954, one reader wrote to Model Maker to say that he had installed an electric motor in a wind-up toy car that ran on a slightly raised rail, from which it picked up current. A second rail, flush with the track surface, provided the negative current. Brass shim-stock was used for pick-ups beneath the chassis and a rheostat controlled the speed. A single shoe-type guide, attached to the chassis, guided the car along the raised rail but allowed it to slide and even leave the track if driven too quickly. Refining the theme using HO scale electric train motors and 12 volt car batteries for track power, a group of British hobbyists from the Southport Model Engineering Society built a six-lane track with a 60 ft. lap length. The guide-rail was made using HO scale train track. In the same year, the Southport club held it's first Grand Prix, with some 30 cars entered. This event was reported in detail in Model Maker magazine and table-top racing took off in England in a big way. Early in 1955, a group in Kalamazoo, Michigan, formed the Model Automobile Racing Association (MARA) and built a track and cars to conform to the 'Southport Standards'. In 1956, MARA mailed four cars to Southport, to be raced by proxy in the Southport Grand Prix. The cars took second and fourth place in the event, the first officially recorded 'proxy race'. On the 20th of August 2000, history was re-created in the Chequered Flag room of the Brooklands Motosport and Aviation Museum in England, when a series of 1/32nd scale memorial rail races were held to commemorate the first rail race held at Southport. The event was organised by Jeff Davies, who also constructed the track, a replica of the Southport circuit. I'm honoured that Jeff had asked me to restore an original Walkden Fisher-built chassis for this event, which I'm pleased to say won both the races it competed in. It's quite sobering when you think about the fact that when Mr. Fisher originally built this car, around 1955, the Mercedes W196 was the latest Grand Prix car at the time. I must say just how impressed I was by the craftsmanship of the original chassis. When one considers the materials and tools available in 1955/56, it puts it into an even more impressive perspective. Above: The original car would have had a hand-carved balsawood body. The restored car uses a replica fibreglass body. When the car was originally built in 1955, the Mercedes-Benz W196 was the latest Grand Prix car at that time! Above: Bottom view of the chassis. The only non-original parts are the pinion, gear, set-screw rear wheels and tyres. Above: Top view of the fully restored 1955 rail-car chassis. More about Rail Racing, predecessor to slot car racing.